What is a New Mexico Promissory Note? New Mexico Promissory Note: What Is It? A New Mexico promissory note is a contract between a lender and a borrower. The lender provides a loan and the borrower agrees to repay it. 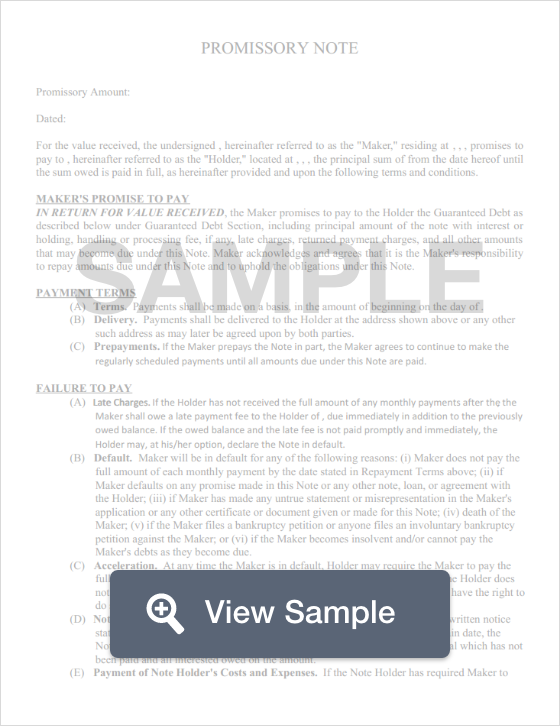 The written promissory note explains the relationship between the parties and outlines how the loan will be repaid. New Mexico promissory notes may be secured or unsecured. An example of a secured promissory note is a loan for a vehicle. If the borrower doesn’t uphold their responsibilities as explained in the promissory note, the lender will repossess the vehicle. The vehicle acts as collateral. In addition to the lender and the borrower, there may also be a co-signer. What Is the Maximum Interest Rate Charged in New Mexico? In New Mexico, the maximum interest rate that may be charged for promissory notes is 15%. If a lender charges more than 15%, they could very well face serious legal repercussions. The date of creation for the promissory note. This date, as well as the date that the document is signed, is extremely important because it helps prove that the contract is valid between the parties. The dates also influence legal deadlines for certain activities, such as filing a lawsuit for defaulting on the payments or for engaging in collections activities. Identifying information and role within the agreement. Every party should be identified by their legal name along with their role. This includes co-signers. For example, Blue Dog Auto Company, Inc., Lender. The mailing address for each party. List the full mailing address for each party. If the New Mexico promissory note is secured, include the physical address for the borrower and any listed co-signer. If the lender has both a mailing address and a payment address, the payment address should be documented with the repayment agreement. The principal loan provided to the borrower. This amount does not include the interest charged on the loan. Before the New Mexico promissory note is executed, this amount should be reviewed for accuracy. Yearly interest rate charged on the loan. This may not exceed 15% under New Mexico law. In the promissory note, this may be listed as the annual percentage rate (APR), yearly interest rate, or per annum. Payment agreement. The payment agreement portion outlines how the borrower will repay the loan. This should include the number of installments the borrower will pay to satisfy the loan, the amount for each payment, and the due date for each payment. If the lender will charge a late fee, the amount of the late fee as well as when it will be assessed. This is the section where the lender’s payment address should be listed. If the promissory note is secured, there should be a description of the collateral. Without a description, a legal dispute could mean that the court treats the note as unsecured. Interest Due in the Event of Default. Many promissory notes start with a lower interest rate and then charge a higher interest rate if the borrower defaults on the agreement in some way. This clause lists the amount of interest that will be charged if the borrower does not comply with the note. This amount may not exceed the state maximum. Payment Allocation. A payment allocation clause defines how payments are split between the principal loan and the interest. Prepayment. A prepayment clause explains whether the borrower will face a financial penalty for paying off the loan early. Acceleration. Acceleration is the lender’s legal right to immediately demand payment in full if the borrower does not comply with the terms of the agreement. Attorney Fees and Costs. For parties involved in a legal dispute over the New Mexico promissory note, this clause explains how attorney fees and costs are handled. Waiver of Presentments. The purpose of this clause is to state that the lender’s actual presence is not required at the time the borrower makes payments. Severability. A severability clause keeps the rest of the promissory note in effect if one portion of it is found to be invalid. Conflicting Terms. This clause explains how any conflicting terms within the agreement will be clarified. Notice. This clause states whether the lender will notify the borrower if they plan to sue because of default. Governing Law. This is the state whose laws will be followed if there is a legal dispute related to the promissory note. There is no legal requirement to have a New Mexico promissory note notarized. To properly execute the note, it should be signed and dated by the borrower and any listed co-signer.